Western Nebraska, the region past Kearney when you follow the sun onto the frontier of the Great Plains, is famously recognized for its Sandhills, the remnants of the retreat of vast oceans that covered parts of the North America continent eons ago. It's an area, encompassing more than a quarter of the state, that features mixed-grass prairie on sand dunes of various sizes - land that is almost perfect for golf courses, especially the links-style golf more commonly found in coastal areas. It's like finding Ireland in the middle of the United States and without question the most unique golfing terrain in the country - a sprawling, scrubby and desolate 20,000-square-mile area that's the largest area of sand dunes in America. The land is well-suited for golf because of the undulating topography, the flora and fauna (with more than 700 species of plants and 300 animal species) and the sheer isolation of it all. You have to really want to get there to get there. Golf in this region was kickstarted in 1995 by Ben Crenshaw and Bill Coore's "finding" of the course that became Sand Hills Golf Club. In the years that have followed, a half-dozen other tracks have been routed that highlight the area's naturally rolling terrain, otherworldly vistas and downright fun factor. 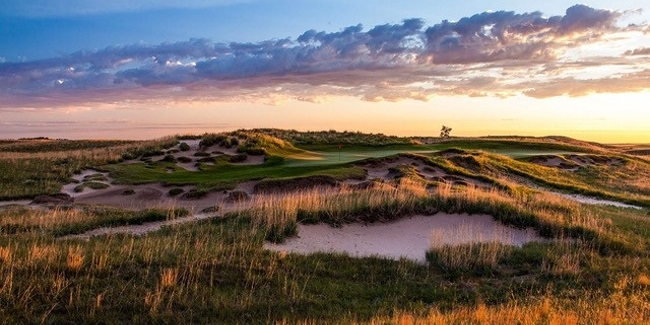 But golf in western Nebraska is much more that rolling links courses and fairways rising and falling through endless horizons of swaying grasses along and atop massive dunes. There's a smattering of parkland style courses as well - and even one that skirts along the banks of a huge lake. The combination of styles helps make this region a haven for great golf and a pilgrimage for players who love to play in isolation. Thirty minutes east of North Platte, just off I-80 in Gothenburg, is Wild Horse Golf Club, which many golfers consider a "poor-man's Sand Hills." Wild Horse, which has been called the "Carnoustie of the Corn Belt" (though it's much more friendly than Carnastie), was designed by Dave Proctor and Dave Axland, who actually assisted Crenshaw and Coore in building Sand Hills. The course is an unusual experience, with a links-like landscape of sweeping dunes and nary a tree in site. The routing sports cavernous bunkers, large, undulating greens and is framed by tall native heather-like grasses. Wild Horse opened in 1998 and has been ranked by Golf Magazine as high as No. 67 on its list of the "Top 100 Courses You Can Play and No. 58 on Golfweek's list of Best Modern Courses (designed after 1960). Carded at 7,002 yards, Wild Horse has no water hazards, just tall prairie grasses lining every hole and blown-out bunkers set in strategic locations. The course has four short par 4s, which temp the player to go for broke on its wide fairways. The other top public (actually semi-private) facility in the Sandhills region is The Prairie Club, set on the rim of the Snake River Canyon near Valentine. The Prairie Club debuted in 2010 and the resort features a pair of full-length courses, the Pines (designed by Graham Marsh) and the Dunes (fashioned by Tom Lehman and his lead associate, Chris Brands) as well as the Horse Course, a fun 10-hole par-3 facility by Gil Hanse that's without defined yardage and perfect for a casual knock-around round to determine whose short game is the best. The Pines Course combines the open prairie and a ponderosa forest adjacent to the river. Its challenge is defined by its putting surfaces' subtle movements and occasional larger undulations. The course plays to a par of 73 and at 7,403 yards. There are blind and semi-blind shots from a handful of the back tee boxes. Drives are played to fairways that are mostly generous but not massive, which adds some intimacy to the round while not jeopardizing playability if the winds are up. Despite the overall quality of the Pines Course, it's the Dunes Course that steals the show at The Prairie Club (www.theprairieclub.com). The architects, who spent 16 months just identifying the 18 holes out of "hundreds" they could have picked, partnered the huge dunes with similarly massive fairways. The radical width disguises how intricate a design the Dunes really is, though. There are times when a hole with a hundred-yard-wide fairway has an optimal line of play that's actually over the rough. The back tees here stretch to 7,583 yards and the Dunes plays to a par of 73. It's by far the most expansive golf course I have ever seen and a compelling round from first tee shot to final putt, thanks to an inspired bunkering, massive width and genius greens complexes. There are so many sets of tees, possible hole locations and cleverly placed fairway bunkers (and an ever-present, constantly switching wind) that give the course a very different feel every time it's played. The Dunes Course ranks No. 78 on Golf Magazine's top 100 public courses in the country. Virtually treeless and without a single water hazard or forced carry, the Dunes Course plays like a coastal links with firm-and-fast conditions and a constant breeze. The staff estimates that the wind blows an average of 20 mph every day, so it no wonder the Dunes Course tends to blow golfers away, literally and aesthetically. On our way into the Sandhills from our embarkation point in Denver, we stopped in McCook and played Heritage Hills Golf Club, a fine parkland track and a hearty challenge despite the fact that it was carded at just 6,715 from its back tees. Opened in 1981 and designed by Bradford Benz and Richard Phelps, Heritage Hills GC (www.heritagehillsmccook.com) offers is an up-and-down experience as most holes begin and end with elevated tees and putting surfaces. The wind plays a major factor in how tough the course plays on any given day, but it seems the wind is always blowing, so take one more club than you think and hold on. Heritage Hill's lush fairways are bordered by native grasses that place an emphasis on shot placement and making smart approach shots into the course's fast and undulating greens. On our way out of western Nebraska, we spent a day in Brule and teed it up at the Bayside Golf Club, the course that provided the biggest surprise of our trip. Bayside is well off the beaten path and is as natural as golf can be. It's a rustic links design by Axland and Proctor (the same guys that "found" Wild Horse) and is set alongside Nebraska's largest lake, Lake McConaughy. The course's routing is over rough and rugged land with arroyos, ruts, bluffs and native grassland, making the experience more of a target-golf challenge than any other course we played in western Nebraska. Axland and Proctor embraced the terrain and turned each and hole into its own challenge, creating a rollercoaster both of emotion and of twists and turns and a continual test from shot to shot. Bayside, which plays to a par of 72 and at just 6,597 from its back tees, offers two distinct nine-hole layouts. The front-nine is flatter and more forgiving and it gives golfer an opportunity to start a round on a positive note. The back-nine features more forced carries and tougher approach shots. Players will never forget the par-5 11th hole, a very imposing 648 yards from the back tees and the longest hole in the state of Nebraska. This hole features 28 bunkers and a very challenging lay-up and approach shot to an undulating green that's of a cape design. Bayside Golf Club was rated a 4-star course by Golf Digest and lauded as the No. 2 public-access course in Nebraska by Golfweek. While the drawing card of western Nebraska is the Sandhills, stop on your way in and out of the region to get a heaping helping of all the golf tests the area offers. It's safe to say any trip to this region is a good one.